Back in the late 19th century there was serious debate within the British and Australian medical professions about how to improve the hanging technique to ensure a quick ‘clean’ death. The problem was that the authorities wanted a quick death for the prisoner after the drop from the gallows, with the neck being cleanly broken, but too many hangings ended with the prisoner being either strangled to death or dying quickly but suffering bloody wounds to the neck, or even total decapitation as happened in Brisbane in 1880. The debate centred on the length of the drop and the type of knot used. Colonel John de Zouche Marshall, a doctor who had witnessed several hangings in English prisons, was convinced that placement of the knot was the most important element of the hanging method, and that the best way to ensure a broken neck and a quick death was to use the submental knot, placed underneath the chin. The one problem with this kind of knot was the danger of it slipping up and over the face after the drop, so to prevent this from happening Marshall designed what he called a ‘chin trough’. The execution rope would be fed through the trough, and when the prisoner reached the end of the drop and the rope stretched, the chin trough would snap back and, in turn, snap the neck. De Zouche Marshall presented his design and supporting evidence to the British Capital Sentences Committee in 1886. Although he had reason to believe that the committee supported his arguments, Marshall was most disappointed when their final report produced a table of drop measurements to be used in conjunction with a subaural knot, placed underneath the jaw near the ear. He subsequently wrote a somewhat tetchy article for the British Medical Journal outlining the evidence in favour of using the submental, while claiming that there was ‘none against it’. The committee preferred the long drop so abhorred by Marshall because they felt it better to risk relatively painless decapitation than slow strangulation. Marshall felt that his recommendations were sacrificed ‘on the altar of departmental red tape’ because he did not belong to the ‘select brotherhood of prison surgeons’. He wrote that the long drop method as preferred by the committee was ‘sure to bring about ghastly scenes at executions, calculated more than anything else to foster the sentimental agitation for the abolition of capital punishment’, perhaps implying that this was the underlying intention of the committee chairman, Lord Aderbare, who was known to be an abolitionist. Doctor James Barr, a member of the Capital Sentences Committee, responded to Marshall’s article by claiming the chin trough was technically faulty and would not reliably work in the manner which Marshall described. He also wrote that for the sake of the prisoner it was more humane to get the hanging over as quickly possible, and attaching the chin trough under the gallows would be time-consuming. While Barr was generally supportive of the use of the submental knot, he believed that the knot type was of secondary importance to the ‘energy of the fall’. This subject proved to be of lasting importance to Marshall, who wrote to the British Medical Journal in 1913 complaining that the official scale of drops had been ‘absolutely ignored’ since its introduction in 1888, and again argued the effectiveness of the submental knot. Another advocate of the submental knot was Professor Frederic Wood-Jones, who carried out a series of tests with Marshall in 1913 by using different knots to hang cadavers knots in order to see what kind of fracture, if any, was produced. 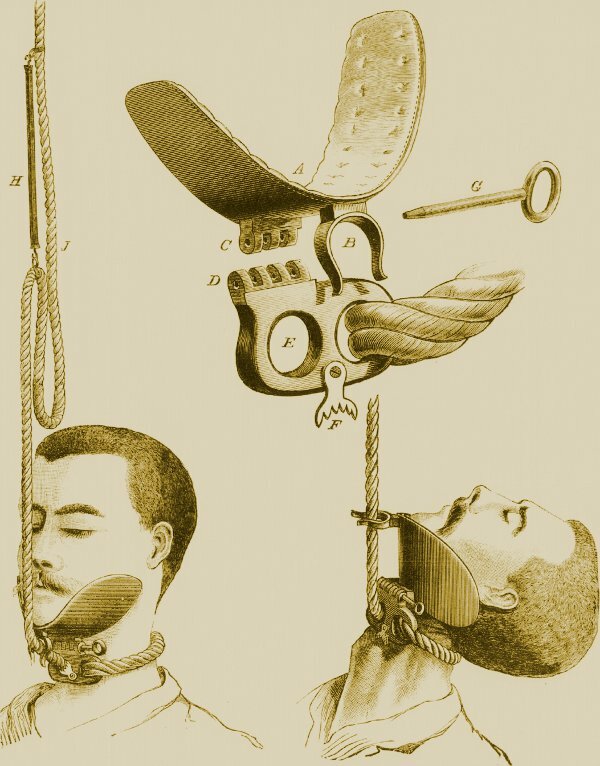 The submental versus subaural argument continued into the 1930s, but it was the subaural that remained the standard knot used in British and Australian executions.